Erin Osborne led the Melbourne Stars Women to their fourth win while Stafanie Taylor spun the Sydney Thunder Women to the top of the Women’s Big Bash League table. Smriti Mandhana and Harmanpreet Kaur laid the platforms for the Hobart Hurricanes and Sydney Thunder’s respective victories on Sunday in the Women’s Big Bash League. 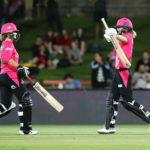 The Sydney Sixers beat the Perth Scorchers by six wickets in Sydney during the Women’s Big Bash League (WBBL), thanks to a masterclass century from captain and Player of the Match Ellyse Perry. The Sydney Sixers of Marizanne Kapp and Dane van Niekerk celebrated a double-header, climbing to fifth on the Women’s Big Bash log. Marizanne Kapp produced a fine all-round performance but it wasn’t enough to prevent the Sydney Sixers collapsing to their third WBBL defeat. 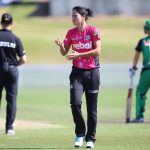 Sydney Sixers all-rounder Marizanne Kapp struck with her third ball of the Women’s Big Bash League season, but it couldn’t prevent her side from losing to Brisbane Heat. Marizanne Kapp produced a remarkable bowling spell of 4-18 which helped the Sydney Sixers through to the play-offs of the Women’s Big Bash League. 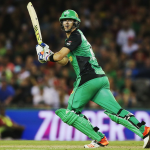 Kevin Pietersen slammed an unbeaten 67 off 43 balls as the Stars beat the Renegades by eight wickets in the Big Bash League Melbourne derby on Sunday. Proteas women’s captain Mignon du Preez found form to hit a match-winning 65 off 57 balls as the Melbourne Stars registered their sixth win in the Women’s Big Bash League on Friday. Marizanne Kapp and Dane van Niekerk found welcome form with match-winning performances in the lastest round of the Women’s Big Bash League in Australia. Eastern Province all-rounder Marizanne Kapp made an immediate impact in a losing cause in the Women’s Big Bash League in Australia.